Welcome to the Parish Church of St Michael and All Angels, Thornhill. You are in good company as there has been Christian worship on this site since Anglo-Saxon times. Mentioned in the Domesday Book, this building is grade one listed and is included in Simon Jenkins’ book “England’s Thousand Best Churches”. 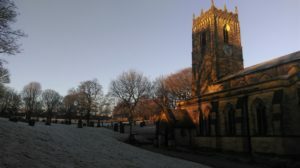 This history website is an addition to our main website at www.thornhillparishchurch.org.uk which gives fuller information about the church and its mission today. 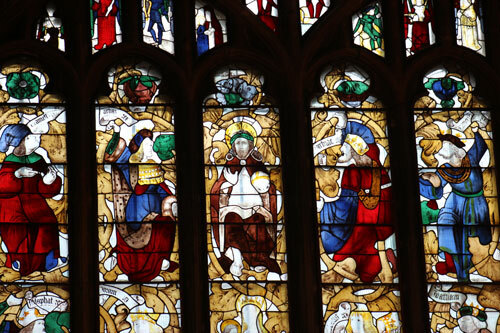 This website contains images and documents relating to the outstanding collection of Medieval and Victorian stained glass .It also provides documentation about the outstanding collection of monuments mostly relating to the Savile Family. We hope that you enjoy browsing the site. The church welcomes visitors at any time but we are specifically open on Wednesday from 10.30 to 2.00 all year and on Sundays 11-4 during the summer. Visits at other times for research purposes may be fixed by contacting the Rector or see the Contacts section on the main site. Researchers are free to download and use images on this website but we request that users use our copyright statement and always credit authors as appropriate. To obtain high quality or digital versions of the images on this site, please refer to our contact page for information.